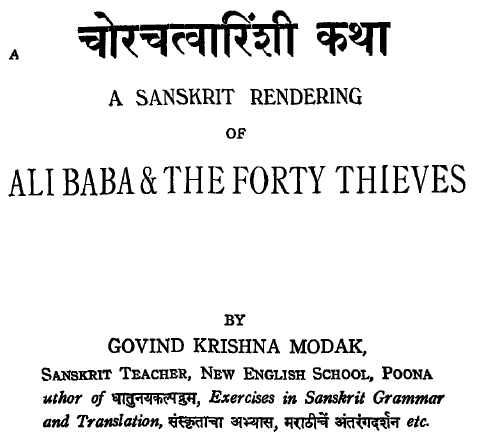 A good friend of mine, today passed on a link to an amazing book - "Ali Baba and the Forty Thieves". Before you wonder what has this got to do with Sanskrit, this is a translation in the reverse direction. So far, I had heard of Sanskrit works being translated in other languages from thousands of years, going to Persia, then to Europe - be it the Pañchatantra, Hitopadésha, Upaniṣhad-s, or the Bhagavad-Gītā, Rāmāyaṇa or Māhābhārata. 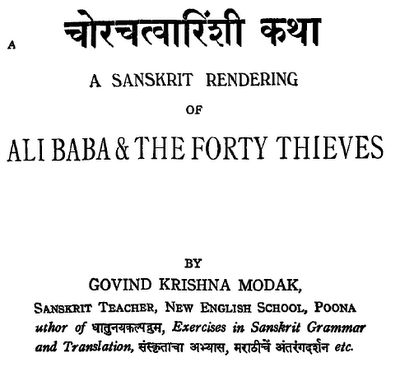 The story of Ali Baba and Forty Thieves from Arabia was translated in Sanskrit in 1934 by Shrī Govind Krishna Modak, a Sanskrit teacher at New English School, Puṇé. Even back in 1934, there were enough good Sanskrit scholars, even at school level, who could translate the whole story, even if it was from a non-Indian background. That implies that Sanskrit does have the ability to express modern topics, alien landscapes, contrary to many who believe that the language is not growing any more, and it cannot grow anymore and is good only for ancient topics. 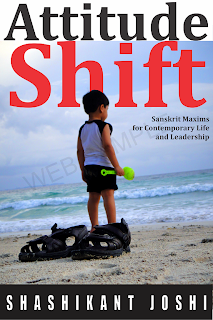 Sanskrit was fully vibrant and alive in lower academic institutions as well. The book opens with a salutation to the divine (namo bhagavaté tubhyam vāsudévāya dhīmaté, नमो भगवते तुभ्यं वासुदेवाय धीमते) as is the tradition in India. The coal-maker destroys the who tree, but the garland maker plucks only the flowers, so the tree keeps giving more. Like the golden goose! The thieves used a cave whose door opened with a magic chant – “Open Sesame” (or “khul jā sim-sim” in Hindi). How do you translate this into Sanskrit work, so that it looks original to the target language, and not as if it is coming from another tongue? Well, it has to be made into an invocative mantra, of course! And that is what Shrī Modak does on page 10.
and the rock would slide and show the cave entrance! 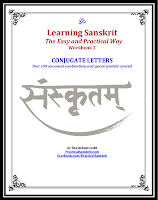 Those with interest in Sanskrit, should try this book, no matter what your expertise in Sanskrit, as long as you can read the script. Very interesting read! Joshi Saheb! i thopught clicking on the pic and other links gonna take to the .PDF as in RBSI posts. I was disappointed. I have already read the book downloaded from Kavyamala series. I found the same very interesting. Actually I could not resist the temptation of reading at least ten pages a day. The slokas there were also very interesting and not very difficult to grasp the meanings. I have already read the book downloaded from Kavyamala series. The story was told very captivatingly and the slokas were easy to understand. All those who know sanskrit may be benefited by reading the book.